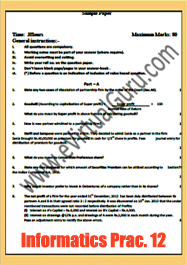 Informatics Practices (065) CBSE Question Papers 2015-2016, Complete Question Papers of Informatics Practices (065) CBSE. Home » E-Books » NCERT » Class 12 » Informatics Practices (065) CBSE Question Papers 2015-2016, Complete Question Papers of Informatics Practices (065) CBSE. i download the cbse ip sample papers. I am not able to print the pdf in hardcopy. Please, send me the password for the security. The PRINT icon is disabled. Please, help me to provide my study.